The Cat on My Head joins Friendly Fill-Ins & Feline Friday blog hops. I hope everyone had a terrific Thanksgiving. I sure did! Of course, I had way too much to eat! As Dad Tom and I are with family, I didn’t get to visit many blogs the last couple of days. I will try to make up for that over the next several days. 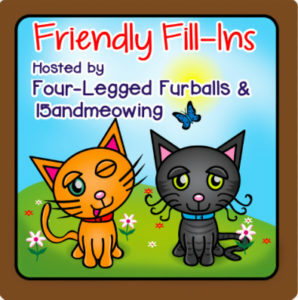 As today is Friday, I am joining the fill-ins blog hop at Four-Legged Furballs. Each Thursday, the furballs’ mom, Lorianne, and Ellen from 15 And Meowing post four sentences to be completed and posted on Friday. I have used teal italics to fill them in. This week I had no help from any of the Kitties Blue. 1. Black Friday: Just say, “no!” If you have followed The Cat on My Head for any length of time, you’ll know that Black Friday, which actually now starts on Thanksgiving Day, is also a pet peeve (see below) of mine. 2. A pet peeve of mine at this time of year is that the days are so short with it getting dark at 5 p.m.
3. Tis the season for eating too much and helping others (both animals and humans) who are less fortunate. 4. I never jumped on the video gaming bandwagon. To participate in the hop, click on the badge above. This blog hop is held each week at Comedy Plus. Lisbeth has decided to join with this appropriate day after Thanksgiving photo, showing her giving thanks prior to tearing into the fresh catnip. 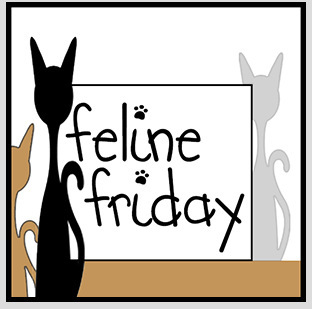 To join this blog hop, click on the Feline Friday badge below. Finally I must apologize again to Teddy and Angel Sammy for not posting a Thoroughly Poetic Thursday poem today as promised. I had just a wee bit too much Sauvignon Blanc to make that happen. I promise that one will accompany our Caturday Art tomorrow. Thank you for joining in on the Friendly Fill-Ins! I am 100% with you on saying no to Black Friday. It also drives me absolutely bonkers that stores now open on Thanksgiving Day. The workers shouldn’t have to miss time with their family just so that people can commercialize the season. Lisbeth, you’ve hit the catnip jackpot! Purrs! Video games are a thing that makes me feel annoyed at the way they consume those who are involved in them, my sons included…at least since they are employed full time, they have to do other things, too…don’t know about housework though, MOL! I deliberately stay away from stores on Black Friday if I can help it. The mom agrees with every one of your fill in responses. She avoids going to the stores on Black Friday…except for today she had to go to Home Depot. Ugh. What a mistake, she said! The place was crowded and they had displays and stuff in the aisles and it was hard to get around. She said…never again. lisbeth looks very happy with her nip. Good fill ins. I agree with all of them. We’re glad you had a nice Thanksgiving! We did too! Chewy is having a Black Friday sale. Just sayin. MOL! Oh boy! Lisbeth got fresh nip for THanksgiving – now that’s 1000 times better than turkey!! After I finish commenting, I’ll read a book and stay inside all day! Black Friday starts before Thanksgiving here and probably the States too. I did get a deep frying pan that was normally over $100 for 27.98. I didn’t realize it was for Black Friday early but what the heck….I liked that one! Lovely picture of a beautiful girl with the nip. Great answers and I agree with you on all of them. We are going to the post office today because that’s where we pick up our mail, but we live in such a small town that shopping isn’t what happens here. That’s it for us. Lisbeth is a pretty girl. I’m guessing the catnip didn’t stand a chance. Good for her. Good Fill-in answers! Lisbeth has the right idea. Nothing like some good nip to start the day. Those were terrific answers and a darn cute photo sweet Lisbeth!